At the end of Year 11, upon receiving their GCSE results your child will have the option to study for A-Levels in a Sixth Form or college, enrol on a full-time college course or undertake an apprenticeship – whichever route they choose it can lead to a successful and rewarding career in the Retail Automotive Industry. Your child can actually start their automotive career at the age of 16 as many employers take on apprentices at this stage. These apprenticeships cover a variety of roles which will conclude with your child gaining a relevant qualification or apprenticeship certificate and work experience within an exciting industry. Although no guarantees are given to them being offered a permanent position within the organisation when they complete their apprenticeship, it is the intention of employers to train and qualify their young people in order to become their full time employees. There are now 2 different types of apprenticeships for you to choose from. The Frameworks or the Standards, below are the key points to consider for both options. Those who choose to undertake a full time college course will also gain a relevant qualification and will be given the opportunity to spend a week or two per year gaining work experience which can be added to their CV and give them the chance to make industry contacts and learn from their placement colleagues and managers. Again, qualifications are available in a number of areas – all of which are excellent starting points for young people to work towards an automotive career. If your child chooses to study A-Levels they can still join the automotive industry upon completion by seeking employment or an apprenticeship in their area of interest. Others do not decide on their career path so soon and follow a more academic route into the industry – many automotive roles, such as in the areas of Sales, Marketing, Finance or Management, are taken by graduates who have studied to degree level. A good place to start looking for an automotive job vacancy is the Institute of the Motor Industry’s job vacancy platform, IMI Auto Jobs and of course other job searching platforms. What apprenticeships are there to choose from? With over 150 different job roles available in the Retail Automotive industry there really is something for everyone. Below are the different Apprenticeship routes available for the sector. As a guide an Intermediate Apprenticeship is a level 2 qualification so its equivalent to GCSE Grades A-C and a Higher Level Apprenticeship is at Level 3 or A Level equivalent. How are apprentices trained to gain a qualification? Day to day you will learn ‘on the job’ with your employer and then ‘off the job’ training will either be through day release at a local college or block release with a national training provider. Block release training is typically 6 to 8 weeks per year and this may involve staying away from home. You will be assessed throughout your apprenticeship by both your tutor and employer – you may also be assigned a workplace mentor to support your learning. What qualification level is an apprenticeship? An apprenticeship can be at various levels. An intermediate level apprenticeship is equivalent to a Level 2 qualification (eg GCSEs or Scottish Nationals), an advanced level apprenticeships is equivalent to a Level 3 qualification (eg A-Levels, BTECs or Scottish Highers) and a higher level apprenticeship goes beyond to Level 4 (HNC/D or a Foundation Degree). The duration of an apprenticeship can be between 1 and 4 years however the majority of apprenticeships are between 2 to 3 years. An apprenticeship agreement will be signed to clarify this before the start of an apprenticeship. Apprentices are paid as per the apprentice national minimum wage, set by the government – this is currently £3.50 per hour for those under 19 years of age or at any age if in the first year of an apprenticeship. Some employers may pay more than the minimum hourly rate and may also fund other expenses (eg travel, food and accommodation whilst on block release training). How do you find a suitable course and training provider? Making contact with local colleges or attending a Careers and Further Education event is a good starting point. If you or they already know what qualification they are looking to gain a course can be found by searching on subject and/or location via https://nationalcareersservice.direct.gov.uk/course-directory/home. What job roles are there in the automotive industry? Please see the #MotorCareers roles on our Explore Job Roles page. An apprenticeship is paid employment combined with structured training in a specific field. An apprenticeship will give a broad understanding of the industry and the workplace whilst learning and gaining a qualification within an Apprenticeship Framework. For the new Apprenticeship Standards (England only) completion of a successful apprenticeship instead leads to an Apprenticeship Certificate. The Government has introduced the Apprenticeship Levy as a new way for employers to contribute to apprenticeship funding with the aim of increasing the productivity, quantity and quality of apprenticeships in England. See here for more information on this and the new Apprenticeship Standards. The new Apprenticeship Standards (England only) have been developed by employer groups in the industry to show what an apprentice will be doing in their job role and the skills that will be required of them. The government have introduced the Apprenticeship Standards to give students more choice as well as giving employers an increased input into their future workforce. 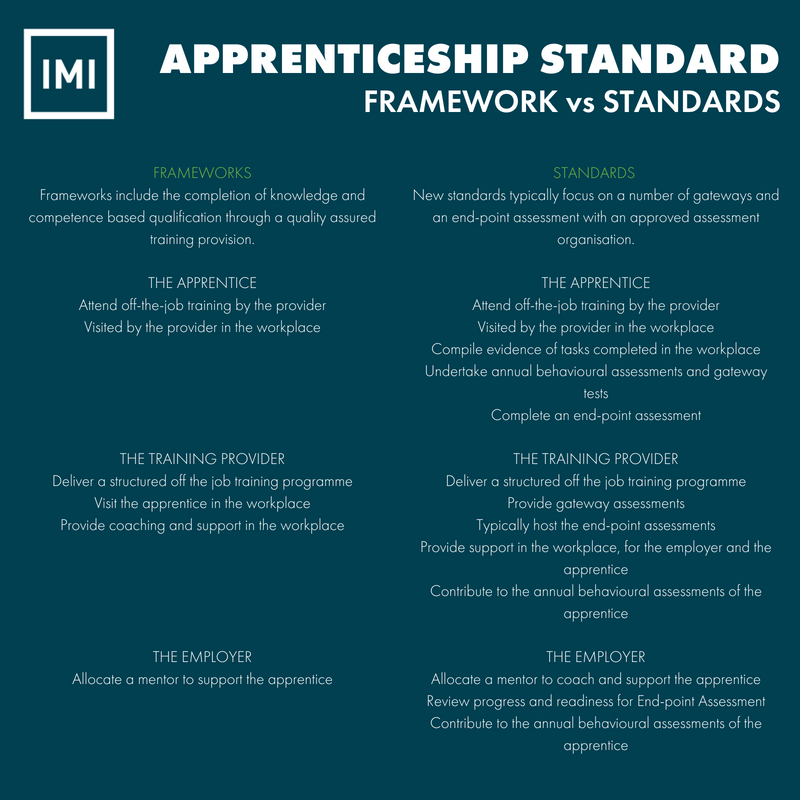 Typically an Apprenticeship Standard will focus on a number of gateways and an end-point assessment with an approved assessment organisation. See here for more information on the new Apprenticeship Standards.